This is my favorite Girl Scout cookie. I have a serious weakness for anything peanut butter and chocolate. I grew up calling these cookies Peanut Butter Patties. It wasn't until I moved to Birmingham, after college, that I heard them called Tagalongs (and Samaoa's and Do-si-dos). This homemade version is really, really close to the real thing, and you don't have to turn on the oven! Score!! They are also a lot cheaper! Is it me or do they seem to have fewer cookies in the box every year? 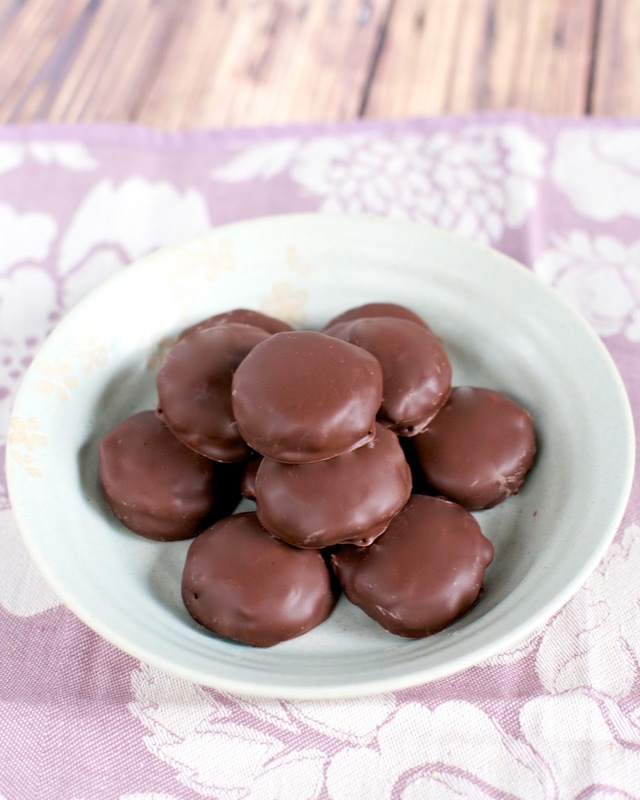 Save this recipe for when your Peanut Butter Patties/Tagalongs stash runs out. Combine peanut butter, powdered sugar and vanilla. Stir until well combined, Top each Nilla wafter with approximately 1 teaspoon of peanut butter mixture. Refrigerate peanut butter wafers for at least an hour. Prepare candy coating according to package directions. Coat each peanut butter wafer with candy coating. Shake off excess. Allow to set up before serving. Peanut butter patties are my favorite Girl Scout Cookie! 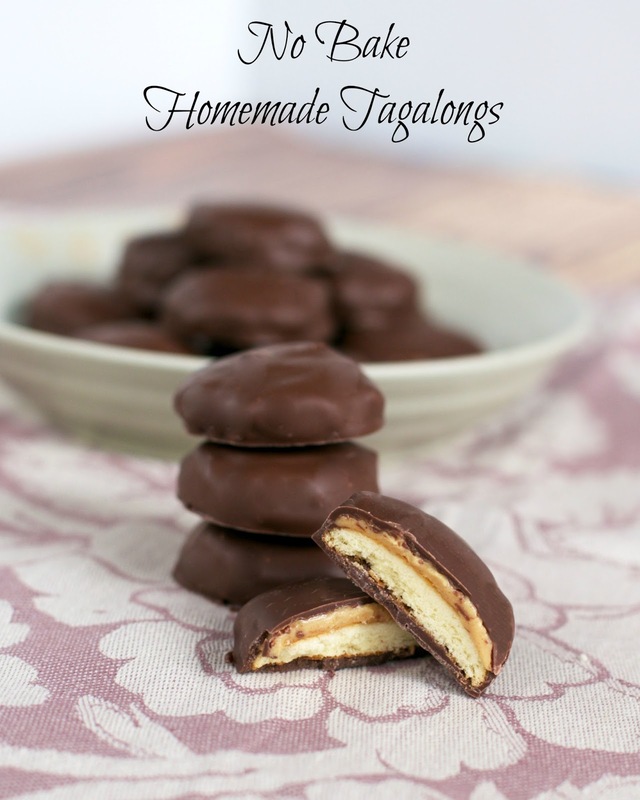 I have never been able to call them Tagalongs. I guess I sold too many boxes of those in my Girl Scout years. How great that you can duplicate them so easily! Pinning! Apparently what they are called depends on the distributor. I guess they have 2 different bakers for the tagalongs & the samoas (another cookie with a 2nd name). I'm not sure why the bakeries get to determine the name, but that's the word my husband got from someone who was in Girl Scouts a long time. Fun fact aside, I made these last week and HOLY GUACAMOLE THEY'RE AMAZING. I had no idea about this naming discrepancy until I order cookies from my husbands familyin NE Kentucky. As I grew up in Nashville I sold Tagalongs, Samoa's, and Do-si-does. I was told that 3 of the 4 types of cookies that I requested weren't available when I placed my order over the phone. I personally think the more creative names rather than descriptive give the cookies more individuality. ...Thanks for the recipe. Will definitively try. What chocolate candy coating do you prefer to use?